Okay, so that title is a tad cheesy, but it was late when I was writing this. 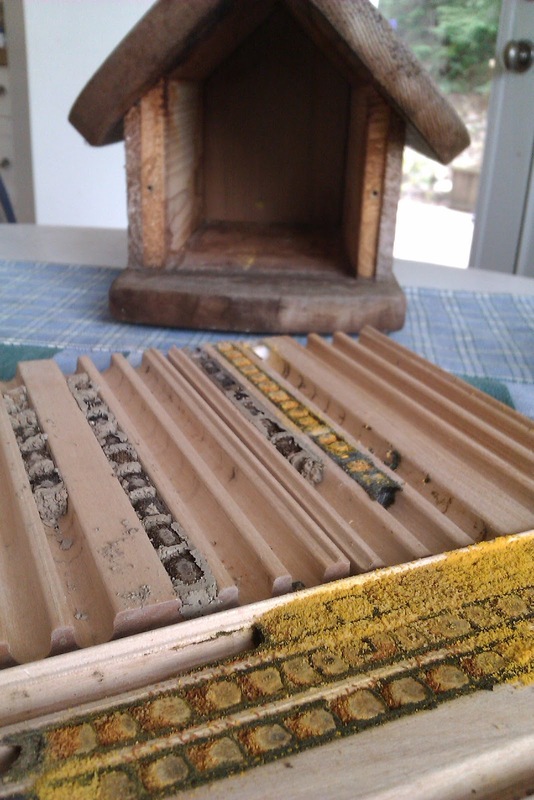 I did my annual mason bee house-keeping a little late this year, but things were looking pretty good despite the neglect. We seem to have had quite a few new masons setting up residence, probably twice as many larvae as I put out last year. We’ll be in good shape if we can double our numbers every year. The house also contained dozens of what I’m assuming are wild bee larvae. 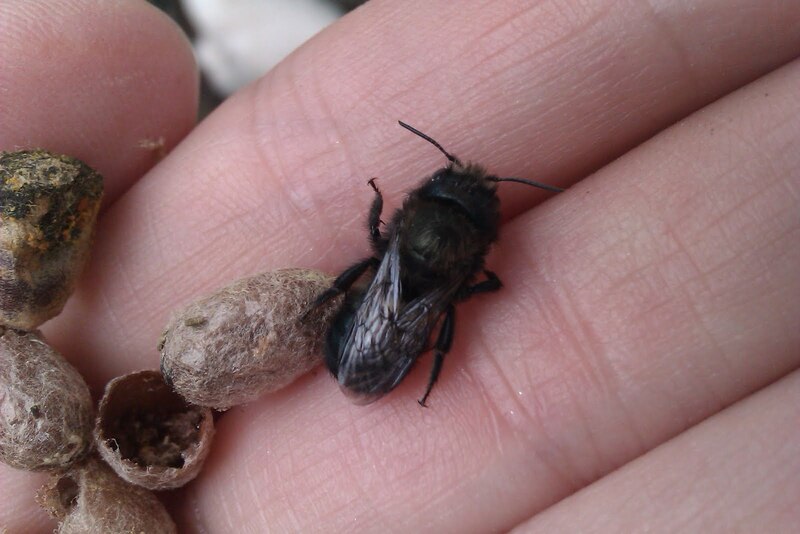 They look similar to those of the mason bees, but there’s a lot more pollen packed in there with them. I’m happy to know that our house is being put to good use by these unexpected guests, especially considering the ongoing struggle that bees have been facing in recent years. 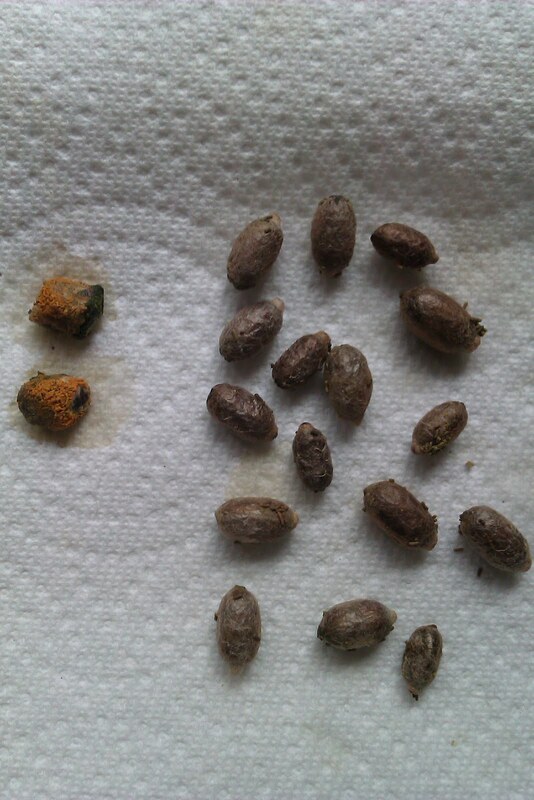 Freshly washed mason bee cocoons, with a couple of the guest larvae on the left. I wasn’t quite sure how to treat these guys, not knowing whether they’d tolerate the kind of bath that I give to the mason bee larvae, so I experimented with washing a couple, and opted to leave the others where they were. After a good scrub, the babies went from their bath and into the fridge until the outside temperatures warmed up a bit. I put them out into the house a few weeks ago as soon as I noticed that my fruit trees were starting to get flower buds on them. 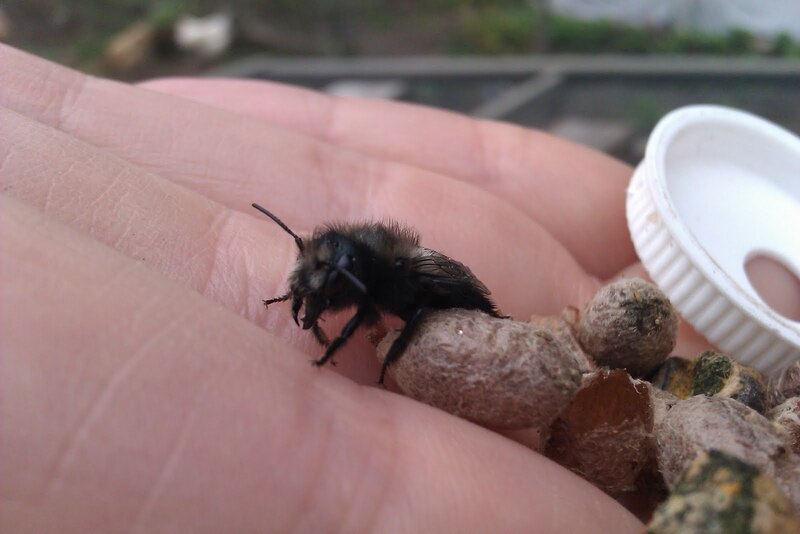 I went out the other day to see whether this year’s batch of pollinators had started to hatch, and this guy tumbled out. It looked like he had only just emerged from his cocoon, somewhat later than the rest of his siblings. The wild bee cocoons were still intact, but it’s possible that they just take longer to mature. 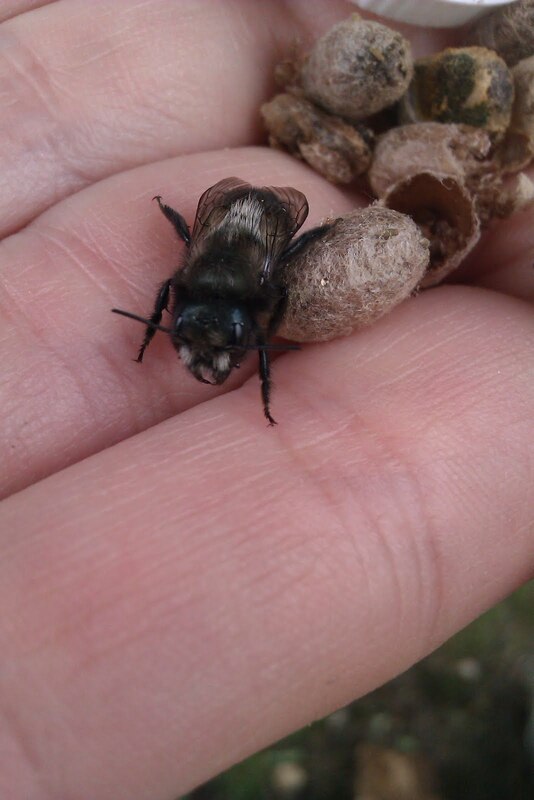 There were still a couple of mason bees left to go as well. On another note (although still bee related), I think I mentioned that I occasionally fill in for my mom and step-dad at their B&B when they go away. I’ve never considered myself much of a people person (too shy for my own good most of the time), let alone someone who’s overly fond of tourists (working as a waitress in a resort town, as well as a hotel front desk clerk while I was in university, pretty much took care of that), but I have to say that their guests are something else entirely. Maybe it’s the funky, East Van neighborhood that the B&B is located in, but the clientele they attract is an amazing bunch. They’re always so friendly and relaxed that I come away feeling like I’ve made great new friends. When I was there inn-keeping in March, there was a young couple visiting from Tennessee who my mom was convinced that I’d hit it off with (they were into bee-keeping and were soon to be getting chickens – kindred spirits!). Of course she was right, as mothers tend to be. Aside from being a really sweet couple, he and Adrienne turned out to be a wealth of information. Jay let me pick his brain about all things “bee” over the course of several days, and gave me a long list of books and information to fill in the gaps before he left. He’s one of those people who seems to just love what he does, and it’s infectious. They have been in the bee business for about 4 years, and are doing it without chemicals. They raise bees, breed queens, capture swarms, and rescue beehives in danger. In addition to selling honey, they also make lip balms which they sell in their Etsy shop. Jay has been kind enough to let me share the link to a post he did recently called 10 Tips I wish some old guy had told me when I started beekeeping. I think it’s a great starting point for those of us who are interested in setting up hives of our own. He hasn’t been blogging for long but the information contained in his blog is useful and the photos are gorgeous. Please pop over and check out the Williams Honey Farm, and be sure to take the time to say hello, we need to encourage him to continue sharing his wisdom with us! There’s a chance that we might get him to agree to an occasional guest post, so if there’s something in particular that you’d like you know about, leave your suggestions in the comments.